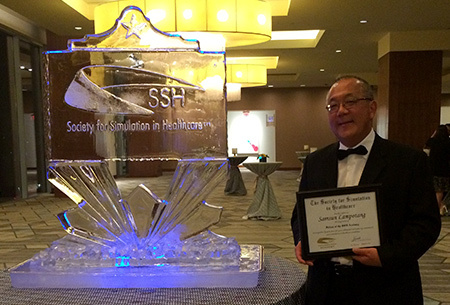 The Society for Simulation in Healthcare (SSH) Academy named Dr. Samsun Lampotang, Professor of Anesthesiology and Director for the Center for Safety, Simulation & Advanced Learning Technologies, to the Class of 2019 Fellows. The SSH Academy recognizes individuals whose sustained contributions have had an impact on the field of healthcare simulation. The Fellows were selected based on their outstanding and sustained contributions to the development of SSH and to the field of healthcare simulation. The Academy convenes a cadre of experts, vetted by their peers, who initiate important work to move the field forward. Selection is based on evidence of sustained contribution and impact on both the field of healthcare simulation and the Society as well as a commitment to support the mission and vision of the Academy. In addition to Dr. Lampotang, ten other individuals were selected to the 2019 class. They join the existing group of forty-nine Fellows who have been selected in the last two years. The class reflects the global diversity and expertise in healthcare simulation around the world that enable the SSH Academy to achieve its mission and vision. The Fellows were formally inducted into the SSH Academy at the International Meeting for Simulation in Healthcare in San Antonio, TX on January 26, 2019.